Priyanka Chopra returns to TV this year in the shoes of her famous role, Alex Parrish, in Quantico. The ABC show aired its first episode in the US on April 26. Here's the review. Quantico season 3 episode 1 titled The Conscience Code premiered in the US on April 26. The ABC show returned a year after season 2's finale episode was aired. The Priyanka Chopra starrer TV show takes a leap of 3 years from the events of the last episode with Alex Parrish seen leading a quiet life in Italy. Thankfully, the first episode doesn't spend too long explaining Alex's backstory. The episode hints about her new family, the new man in her life and her new BFF. But 5 minutes into the episode, Alex is seen back into action when an unidentified group of men attacks her leaving Alex to find her way back to New York and Ryan Booth. Things are not as they were 3 years ago. Shelby is in control of Widow who wants the Conscience Code. The code is with Alex, who refuses to give it and go against her country. The first episode runs through the events on how Alex and Ryan form a team with the help of Harry Doyle, Owen Hall and Jocelyn Turner and save Alex's best friend Shelby. Without getting into the spoilers, Quantico season 3 episode 1 delivers a good comeback for Alex and her team. But somewhere, it leaves you asking for more. There was action, the story was fast-paced and there wasn't too much emotional drama to the episode but it felt like it was not enough. Marlee Matlin stood out in the episode. Matlin, who plays the role of ex-FBI agent Jocelyn who lost her ability to hear after a bomb blew up near her, easily mixes with the regular characters and makes her screen presences felt. Taking absolute control of every scene she is in, Chopra proved she was the right choice for Parrish on the show. On the show, Chopra is seen talking in Italian and ASL with ease leaving everyone asking: What can this woman not do? 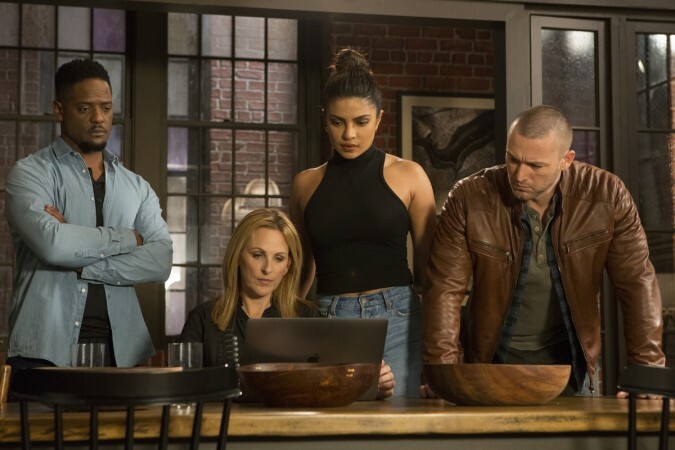 Bottom line: Quantico season 3 episode 1 was a good way to start the season but there are 12 episodes more and hopefully more drama and action. It's been three years since American hero Alex Parrish (Priyanka Chopra) has had to navigate the dangerous waters of the Central Intelligence Agency and put her life on the line for her country. She has been living a peaceful, anonymous life somewhere in Italy. However, Alex is forced to abandon this idyllic existence when Ryan (Jake McLaughlin) persuades her to help him rescue Shelby (Johanna Braddy) from a notorious international arms dealer known only as The Widow. Ryan and Alex recruit Owen (Blair Underwood) and Harry (Russell Tovey) to help rescue their friend and defeat the villain. To help the cause, Owen brings in former agent Jocelyn Turner (Marlee Matlin), who has her own dark past with The Widow. Quantico season 3 premiered in the US on April 26 and can be watched online through ABC's website. It will air in India on April 28 at 9 pm on Star World and Star World HD.